GCU LLB Law and Law Clinic Alumnus, Ian Laing, made his mark on the legal world when he landed an unprecedented traineeship at the WS Society. Ian Laing was an honours law student here at GCU and in his 4th and final year, he earned the position of Student Director of the GCU Law Clinic 2015/16. During this whirlwind year, Ian had great success in the Law Clinic, forming an excellent team with great rapport. This was also the year the Law Clinic were finalists in the Scott + Co Scottish Legal Awards 2016, and the year that Ian and his fellow classmate, Ryan Bell, led the Law Clinic to victory in their first ever court appearance. Ian was also shortlisted for the GCU Student Associations ‘Student of the Year’ award, which is university wide. Both the law department and Law Clinic here at GCU were sad to part with Ian upon his graduation as he went to embark upon obtaining a Diploma in Legal Practice. However, Ian has continued to support the GCU Law Clinic in a supervisory role as he remains a passionate advocate for increasing Access to Justice. 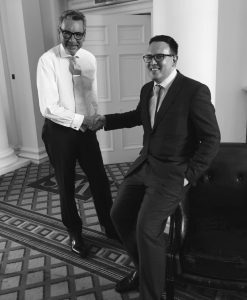 Ian Laing (right) being congratulated by CEO Robert Pirrie WS (left) on his first day as the first trainee solicitor (@thewssociety). Following the successful completion of the diploma, Ian began his journey as trainee solicitor for the WS Society in September 2017. Ian stated that, unlike a typical traineeship, there was no application process to land this role, as he already had a foot in the door. Ian initially secured a place on the WS Society summer internship programme in 2016, which he said he felt was due to the opportunities he had received as part of the GCU Law Clinic team. As his time on this summer internship came to an end, Ian was then offered a legal assessment role within the team for the remainder of summer 2016 and subsequently part-time during his diploma year 2016/17. Luckily for both Ian and the GCU Law Clinic, Ian’s director is supportive of his desire to retain involvement in the Law Clinic and has even extended an invitation to the Law Clinic to attend WS events throughout the year. The Law Clinic is grateful that it will have the continued support of such a successful alumnus and ambassador for his successors of the Law Clinic, and we look forward to see what the future holds for Ian.